I know many of you have already turned from hearty winter dishes to light spring fare, but since Judi told me they had snow in Santa Fe the other day, and we're in the middle of a nice gray and rainy weekend here on the farm (Grow, grass, grow! ), I figured we might not be the only ones still wanting to cozy up with a piping hot bowl of comfort. This flavorful soup is thick and rich, but not loaded with calories or cream. Can a simple pot of soup expand your horizons, change your life, and turn you into a more interesting and exciting person? I say yes. I know. That's a lot of new stuff for one little soup recipe. 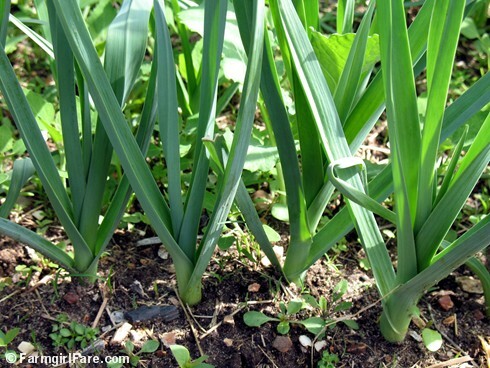 As soon as I tasted the roasted leeks, I wondered how in the world I'd spent the first 40 years of my life leekless, and I vowed to make up for lost time by painstakingly putting 400 tiny leek plants into the garden a month later. Some freaky March and April weather pretty much ruined my crop, sending it bolting skyward to the land of tough and inedible stalks, but at least the flowers were pretty. Before they bloomed, Lucky Buddy Bear harvest about 70 or 80 baby leeks with his paws, which I thought at the time was a tragedy. It turns out they were the only ones we ended up eating. They were delicious, but it felt kind of weird knowing that you'd just eaten three dozen leeks in one bowl of pasta. And I definitely recommend expanding your horizons and trying something you've never done. If you're anything like me, you won't even have to leave the kitchen to do it. A little crumbled bacon adds a nice salty crunch. I looked at a lot of different leek and potato soup recipes before deciding to try Ina Garten's version in Barefoot Contessa Back to Basics (a cookbook I'm loving). Two things drew me to it: the fact that she roasted the potatoes and leeks, and the interesting addition of arugula. I love tossing fresh greens into places they aren't usually found (like tuna salad), and I'm a sucker for anything that calls for arugula, especially since it's so easy to quickly grow from seed. I made several changes to the original recipe, including skipping the heavy cream and creme fraiche (which I never have around, even though I know it's extremely easy to make), upping the amount of leeks and arugula, and streamlining a few of the steps. An immersion blender isn't required here, but it certainly makes things easier. I couldn't get myself to fry up the crispy shallots in 1½ cups olive oil for the garnish, partly because I knew most of them would never actually make it onto the soup. A little crumbled bacon makes a nice substitute, though it's definitely not necessary. I've made this soup with onions in place of the leeks, and organic baby spinach in place of the arugula, and while both substitutions were very good, I prefer the leek and arugula version. I also tend to prefer my soups on the thick side. If you like yours thinner, just add a little extra chicken stock until it's the desired consistency. Another thing you can do is use just 1 cup of chicken stock and serve this as a purée. My recipe notes also say Eat leeks and potatoes right out of the oven as a side dish. Homemade chicken stock is so much better anything you can buy and ridiculously easy to make. It also freezes beautifully. All you have to do is put a few pieces of uncooked chicken or a leftover chicken carcass (make sure there's some meat on it so you don't end up with bone broth), a few carrots, a couple of quartered onions, two or three ribs of celery, a handful of parsley, and some black peppercorns into a pot, cover with water, bring to a boil, then simmer gently for several hours and strain. Yep, that's it. As always, I urge you too seek out local and organic ingredients; they really do make a difference. At under $50, a digital kitchen scale is a worthwhile investment that makes life so much easier. I often use my Oxo Good Grips 11-pound scale several times a day. It's also great for weighing postage. Heat the oven to 425°. Combine the potatoes and leeks in a large roasting pan. Add the olive oil, 1 teaspoon salt, and pepper and toss to coat the vegetables evenly. Roast, stirring occasionally, until they're very tender, about 40 to 50 minutes. Add the arugula and toss to combine, then roast for about 5 more minutes, until the arugula is wilted. Remove the roasting pan from the oven and place it over two burners on the stove. Stir in the white wine and 2 cups of the chicken stock and cook over low heat for a few minutes, scraping up any dark and crispy roasted bits that are stuck to the pan. Transfer the contents of the roasting pan to a large pot. * Stir in 2½ more cups of chicken stock, 1 cup of milk, the Pecorino Romano, another teaspoon of salt, and several more grinds of fresh pepper. Using an immersion blender, puree the soup, adding more chicken stock if it's too thick. Cook over low heat until hot, check the seasonings, and serve, garnished as desired. * If you don't have an immersion blender, carefully purée the contents of the roasting pan in a food processor or countertop blender, then transfer it to a large pot and stir in the 2½ cups chicken stock, 1 cup of milk, Pecorino Romano, and salt and pepper. How about some homemade bread to go with your soup? Can't survive on soup alone? You'll find links to all my sweet and savory Less Fuss, More Flavor recipes in the Farmgirl Fare Recipe Index. © FarmgirlFare.com, the slurp it up foodie farm blog where homemade soup isn't just a way of life, it's an adventure—and happiness is knowing there are three or four different kinds safely tucked away in the freezer for those days when there is no way you have the time or energy to cook, since we can't even get the mail delivered out here, let alone pizza or Chinese food. I've been waiting patiently...okay, not so patiently. I planted arugula today, but I won't be waiting till it's ready to try this. My arugula (or as we call it, rocket) has just sprouted. 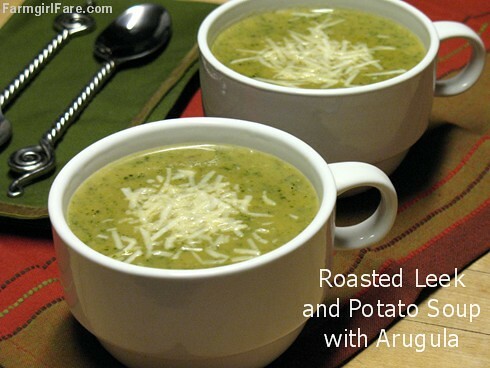 And we're heading into winter now so I think those are two excellent excuses to try this soup! That and I too have never bought, cooked or eaten leeks. Well, how wonderful is it that Judi Hendricks left you a Comment? I love her books and now I'm going to explore her website and somewhere inbetween that I'm going to make this soup - it sounds sooooo delicious! (and I love, love, love soup!) Thank you so much. Thanks to you, I have a few sad leeks in the fridge that will become stars today. Potato & Leek soup is one of my absolute favorites. 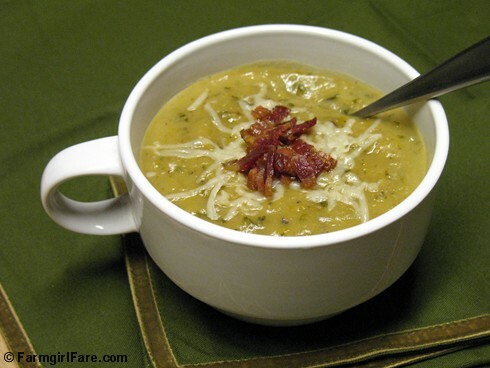 This has been my got to recipe forever http://chocolateandzucchini.com/archives/2008/01/leek_and_potato_soup.php I do use chicken stock in place of water and a dollop of sour cream and/or a sprinkle of bacon makes it magical. Thanks for the heart warming recipe on this quite cool Missouri morning. Can't wait to give it a try. Oh, I forgot to add that my husband prefers soups with a little more body, so I just use my old potato masher to mash the soup up a bit. this sounds wonderful, I can't wait to try it! i feel the same way about leeks!! i cannot believe i went so long without them. 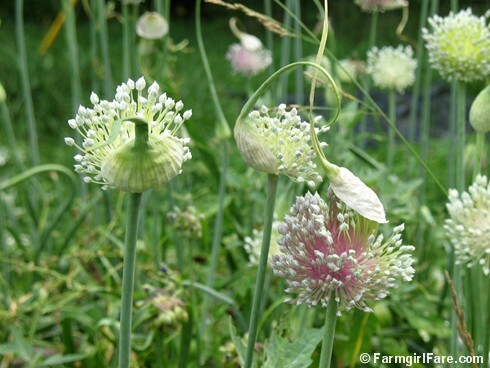 my sister grew baby leeks last year and is experimenting on growing full size this sumemr, cannot wait to try myself. will have to check out Judi's books. thanks! been too long for me without a daily dose of cute!!! so we appreciate all those things sitting in your pantry while we enjoy the cuteness! What a tasty potatoes & leek soup. This is a classic typical soup from Belgium!! We do love our soups!! I also love that you added rocket ( arugula )!!! MMMMM,...I love your toppings too! I love potato soup with leeks, but I usually make a cream base. Thank you for sharing,I'll have to try this recipe instead. Saw this and had to make it and MAN is it good. wow. I used Kale instead of arugula and it is deeeelish. I found this while searching for something to do with the lovely collard greens from my CSA--I've narrowed it down to either this soup or your swiss chard and artichoke pizza! Both look great! This is wonderful! I have to try. Thank you for sharing :-). Does this soup freeze ok? I ended up making a HUGE batch! This is the most amazing potato leek soup that I've ever had! I left it a little chunky to get some of the roasted potato bites. Just sent the recipe off to my mom and sister... Absolutely delicious!